When a normally balanced or low fat diet is interrupted by a very high fat content series of meals, a condition called pancreatitis can occur. 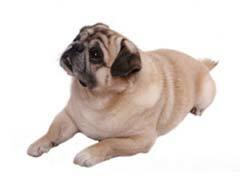 Pancreatitis in dogs causes the pancreas to become inflamed, and to create too many enzymes. High liver enzymes in dogs can then lead to extreme discomfort and digestive problems. Veterinarians report that acute pancreatitis in dogs usually happens around Christmas, Thanksgiving, and Easter, when owners are most likely to feed fat-laden scraps to their canine companions. What seems like a kind gesture can turn into a painful, uncomfortable event for your pup, and even into chronic pancreatitis. However, if an acute attack should occur, the first step is to recognize the problem. Pancreatitis in dogs symptoms include excessive or lack of drinking, bloody, oily or gray stool, depression, or vomiting. A veterinarian is the best choice for a dog illness diagnosis, and may then recommend an altered diet until the pancreatitis subsides. When feeding for pancreatitis in dogs, it is best to include meals rich in carbohydrates, and very low in fat. Avoid canned foods high in fat, table scraps, or dog foods that contain gravies. There are specially formulated foods available specifically for pancreatitis in dogs, and to maintain healthy digestion. You may also want to consider homemade dog food, as healthy dog foods are easy to cook and much cheaper than specialty foods. These recipes often include simple ingredients such as rice, squash, or chicken broth. It is also important to keep your pet hydrated, as pancreatitis in dogs can cause vomiting and dehydration. Ultimately, the best solution is to prevent any kind of problem before it flares up. Monitor your dog’s diet, keep him exercising, and resist the temptation to feed fatty scraps and treats to your pet. It will save you both a lot of frustration and suffering!